The Liberal Party announced its new finance minister Wednesday afternoon, and this is what is known about the man who takes over one of the most important posts in the cabinet – and what brokers hope his policy will be pertaining to the mortgage industry. 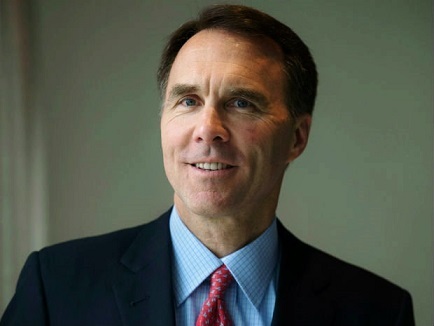 It remains to be seen how Finance Minister Bill Morneau will oversee the housing and mortgage industries, but brokers have already weighed in on what they expect from the new finance head. “I’d like to see him revisit RRSP limits for the Home Buyers Plan; raise it to maybe $35,000 or $40,000,”Brad Currie, a broker with Verico Coastal Mortgages, told MortgageBrokerNews.ca. “I work in Vancouver and prices are high, so that would help buyers. “Other than that, just bring more common sense to mortgage underwriting; the red tape and rules to present mortgage default have gone too far. Many brokers will likely hope Morneau follows the lead of former Finance Minister Joe Oliver, who did very little to rein in the housing market. It’s an approach that was at odds with his predecessor, Jim Flaherty’s. “I don’t think much should be changed [by the next Finance Minister]; the guidelines for lending in Canada are already pretty strict,” Darin Bauer, a broker with Mortgage Intelligence, recently told MortgageBrokerNews.ca. “It’s still quite difficult to get a mortgage in Canada, especially as a self-employed Canadian. The new finance minister is the former chairman of the C.D. Howe Institute; he holds a Master’s of Science in Economics from the London School of Economics, and an MBA from INSEAD; he has held a number of executive positions at Morneau Shepell, the country’s largest human resources firm. Morneau will be tasked with handling the Liberal’s promise to boost taxes to the rich and provide tax cuts to the middle class, among many other economic issues. How about 85% LTV Refinance? If it's a wish list go big: 90% insured refi! !